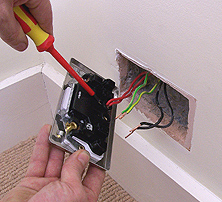 Firstly before you do anything Make sure your power is turned off at the consumer unit. 1 Unscrew the two retaining screws on the switch and pull away the socket. 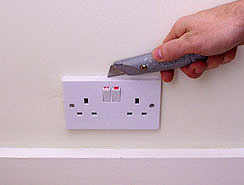 Tip If it's an old socket that has been painted around many times over the years a good idea is to score round it with a sharp knife. This stops you pulling away the paint work on the walls. Check that there is no live with your voltage checker, having previously checked that the voltage checker is actually working. 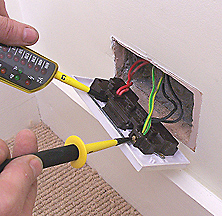 Socket outlets are usually on a ring circuit so you'll probably (but not necessarily) find a live, neutral and earth cable coming in, then another going out to the next socket. Unscrew the live neutral and earth cables. These will be red(live), black (neutral), earth( green and yellow sleeving). Make sure the cables are nice and tight and no bare wires are showing. Re-fix the new socket to the back box and turn power back on.